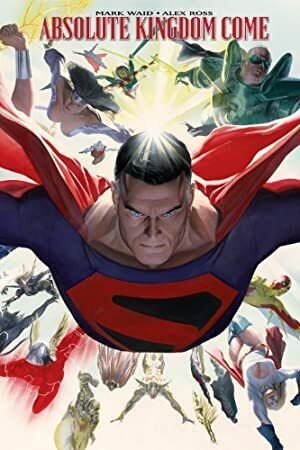 Kingdom Come was a landmark 1996 mini-series, depicting a possible — and rather grim — future of the DC Universe. A version of Mister Terrific is seen in this future. But he seems to have little in common with the heroic legacy started by Terry Sloane in 1942, and continued by Michael Holt from 1997 onward. The only thing for certain about this Mr. Terrific is that he bears little connection, in appearance or in mindset, to either of his predecessors. He knows the access codes for verbal operation of the android war machine known as NIL8. But it is doubtful that he is the android’s creator. Mr. Terrific III has no innate powers or abilities. Just a lot of firepower strapped to his body. Mr. Terrific III is big. Real big. And he wears this… thing, this portable gun rack. Large rifles protrude over each shoulder and jut out by each of his hips. A small rocket launcher is attached to each of his forearms. 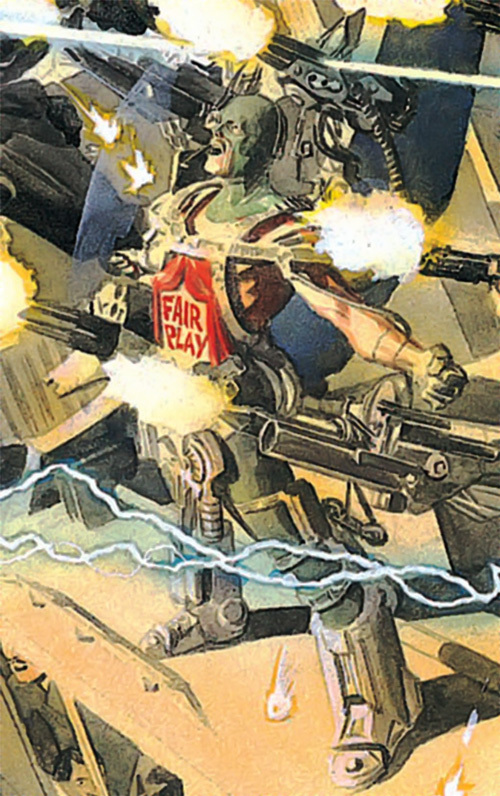 He resembles his predecessor only in that the words “Fair Play” are emblazoned on his abdomen. It takes a very big ego to name yourself something like “fantastic” or “terrific” and the third Mr. Terrific has no shortage of conceit. He believes himself to be the one true crusader for justice remaining in the crazy world of Kingdom Come. To him, justice and “fair play” aren’t as simple as they once were however. Fairness must sometimes be enforced with a clenched fist. He acts as though guided by a moral code no other mortal can understand, lofty arrogant, and following his own rules. In short, he is everything Terry Sloane stood against. GUN RACK [BODY 07, EV: 12, Projectile Weapon: 06, R#2, Bonus: EV (guns) may be divided up to 4 ways for shots at up to 4 different targets. Consult your local GM for house rules on how to attack with multiple similar weapons ; Projectile Weapons usable only twice (1 rocket on each forearm)]. Shield Generator Belt [BODY 04, Force Shield: 06, R#3]. Targeting Eyepiece [BODY 02, Telescopic Vision: 06, Ultravision: 06, Thermal Vision: 04].